Mediterranean Cooling Towers was set up by Jared Smith an Australian shore-based engineer back in 2010 under a different name. He then met Geoff Clarke a New Zealand sea captain and engineer and the pair immediately hit it off. Wind forward to 2015 and the duo completely re-branded the company and Mediterranean Cooling Towers was born. Currently delivering cooling towers to superyacht shipyards across the Mediterranean, the business is growing at a rapid pace. The cooling towers are a genius idea from an economic, environmental and work perspective. They replace the job of saltwater at sea when the yachts are out of the water in the shipyard allowing for the whole boat’s system such as refrigeration, air-conditioning and AV to continue functioning as if normal. It allows the crew to work as they would at sea, reduces the impact on the interior by eliminating the existence of moisture or simple overheating and frees up shipyards’ precious supplies of water. 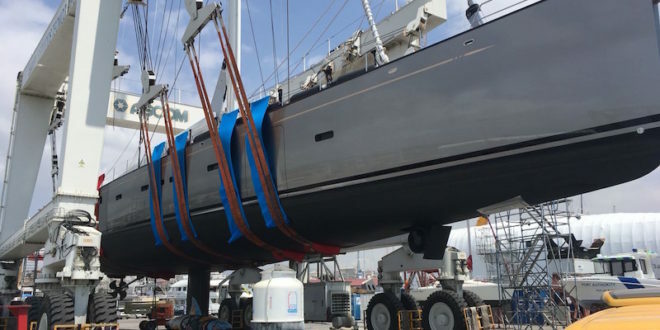 Mediterranean Cooling Towers is currently the only company supplying such towers to the marketplace and they have already worked with hundreds of superyachts during their refits. The company’s ethos is for everyone to win: the shipyard, the superyachts and themselves. They do this by delivery excellent quality products with the backing of service with a smile. In fact, not just a smile, but a decent helping of fun as well. The boys meet at the go-karting circuit every Friday for their weekly board meeting, have borrowed the arrow logos from Porsche racing and the font from Star Wars. There is definitely a distinctly antipodean tilt to this most Mallorquian of companies. All material and labour are sourced from the island where possible, as they wholeheartedly want to support the island that they so love. The tower body is manufactured from fiberglass reinforced plastic and is non-reactive with the vessels piping system. The Fan motor itself is a sealed unit, driving ABS plastic blades designed to draw the largest capacity of air through the cooling medium, to give the most efficient differential cooling temperature for the safe operation of the vessels equipment. Custom designed electrical control unit with thermal and standard European protection. The inhouse designed bases have been constructed to provide a sheltered area for operation and ease of access to the control valves and monitoring gauges. The compact design of the cooling towers ensures that when in operation they are inside the footprint of the vessel on hardstand, with the shortest possible power cable and supply/discharge feed lines. Specifically designed for single vessel use, meaning no cross-contamination or interruptions to supply while connecting other vessels. Induced draught evaporative cooling towers are an efficient, eco-friendly, healthy option for keeping vessels in normal operating mode when not afloat. This is not an air-conditioning unit. The cooling tower simulates normal sea water circulation through the boat. The tower connects directly to the sea water inlet and outlet points. 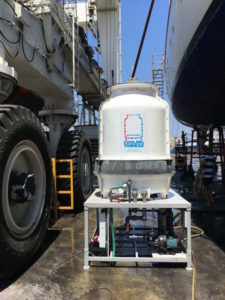 Operating the vessel with the specifically designed closed loop, filtered cooling, gives the seawater side of the system a health check, by removing any seaborne growth and containing such growth in the filtration strainer so as to not re-inhabit the vessels system.